I pulled out the last of the Brussels sprouts without brussels. I’d been watching them, waiting. I asked the farmer when I saw them getting cabbage worms. “Should I spray?” I didn’t want to spray. I wanted to be organic. Spraying would make me no better than the chemical companies I was trying to avoid. Proactive. Not reactive. It’s a philosophy that works well in life, not just on Brassica. Epic fail in failing to thinking ahead and being too holier than thou to spray. Still, the things grew and grew. Bean stalks perhaps? I left them. No brussels appeared. “Google, when should these brussel?” I searched. Nobody told me what to do when my Brussels sprouts didn’t brussel. There was no support group, no help. I asked my friend the garden guru. “Pull them out,” she said. I obeyed. It was a sad moment. I’d invested a lot of time, space, and love into these barren stalks. Pulling them out wasn’t easy, but it was the right thing to do. There wasn’t one sprout I could eat as a consolation prize. 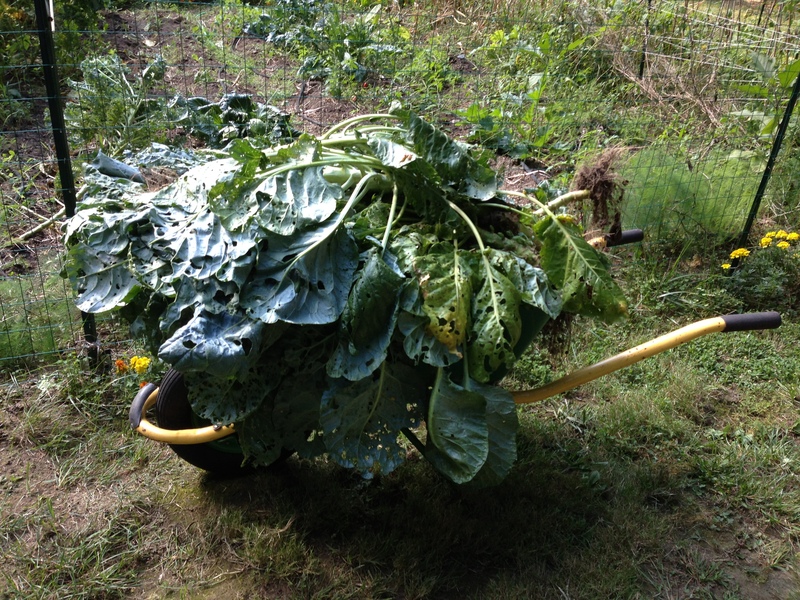 If you haven’t seen Brussels sprout plants, they’re huge. Quite an investment in garden space. It’s probably why I let them go so long. When investing in something that’s going sour, the temptation is to let it go another day to see what happens. It’s no different from being a gambling addict…everyone’s always hanging on to win the jackpot…the casino knows most people will play one more game tomorrow. I was playing with Brussels sprouts, but the endorphins are the same. Spinning the roulette wheel one more time. I came up short and the table cleared. No return forthcoming. I ripped up the Brussels sprouts and took out the browning cornstalks for good measure. They’d produced two-inch twisted baby corn, then met their maker. I bundled them up and converted them into a “decoration,” next to a pot of unbloomed mums. They looked sad. 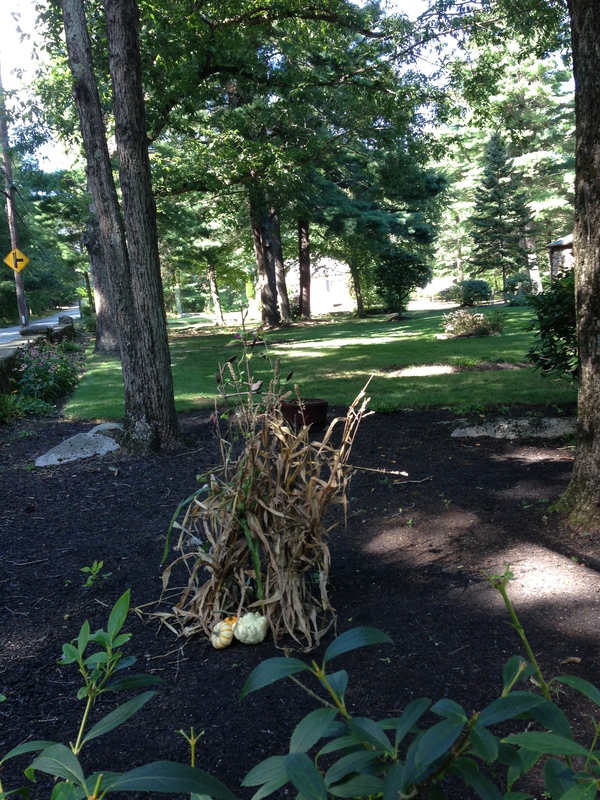 The mums turned completely away, protesting, refusing to open until deformed corn was removed. Lesson learned. Sometimes things don’t produce. Things that don’t produce have to go. The moral of my stories is generally the opposite. I discuss education. I talk about student success…flowers blossoming in their own time… Not today. Sometimes it’s best to realize things aren’t going to come to fruition. A policy won’t change, a student won’t be interested in graduation despite my very best efforts, or a collaboration won’t work out. At some point, it’s time to change direction. Waiting for things that won’t happen is not useful. I could have done something far more productive with garden resources. Nature doesn’t force a bloom. Nature also corrects for things that don’t work out. It’s not a bad thing–everything ends up doing what it’s supposed to in its own time. But that doesn’t mean I should sit around and wait. I pulled the eggplant with no blossoms, and took out the dried beans. “Even Jesus wiped out a fig tree that didn’t bear fruit,” I thought. The sprouts and corn are gone. Finally. Should’ve done that months ago. I could have been eating a great fall crop of broccoli or lettuce right about rather than waiting for stuff that I sensed would never come to pass. Could this be a life lesson? Something useful for the classroom, too? Maybe I should let students make their own path without judgment or not go crazy at work trying to solve all the problems of the universe. Who knows. Today, I’m just ripping out the veggies. I’ll let skilled philosophers figure out the rest. This entry was posted in gardening, teaching, Uncategorized and tagged Brussel, brusselsprouts, corn, crop failure, crop pests, fig tree, free will, Google, Jesus, motivation, Olive oil, Roulette, teaching, Thanksgiving by cafecasey. Bookmark the permalink. awesome analogy! I am sure you will find a way to use this in the classroom. Sometimes our kiddos just don’t fit into our strange time tables. Why must you be five on or before September 1st??? Is there some kind of weird Voodoo magic attached to that date? And if you fail to master third grade curriculum in the 180 days we provide, why must you repeat the entire shabang? Perhaps your Brussels would have Brusselled had they been given remedial small group instruction in brusselling. Try that next time.